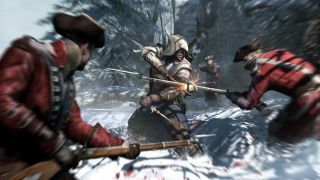 Update: Ubisoft's free offer has now ended and Assassin's Creed 3 is back to full price. As part of its 30th anniversary celebrations, Ubisoft is giving away some of its classic titles free for a limited time. The latest free download is Assassin's Creed 3 – the fifth major instalment in the series, which was originally released in 2012. The game sees modern-day assassin Desmond Miles take a trip back to the 18th century. There, he assumes the role of his ancestor Ratonhnhaké:ton (aka Connor) during the American Revolution, and relives his fight against both the British Army and the Templar Order to unravel an ancient mystery. The game moves the urban free-running from earlier games to the natural world, enabling Connor to hop between trees and mountains, traversing huge swathes of frontier wilderness. Stealth also received an update, with long grass and trees serving as cover for sneaking and eavesdropping, and crafting relies on a combination of trade and hunting to gather raw materials. As usual, the story sticks closely to the history books in places while taking convenient departures in others – all explained via the series' sci-fi conceit, the Animus. Ubisoft is giving the game franchise a rest this year, so this is the perfect time to give Assassin's Creed 3 a try.